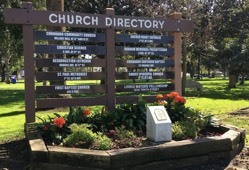 The concerns first arose when Ryan Meoni, a 20-year-old who grew up in Coronado, complained to the Freedom From Religion Foundation about the sign's use of the word "church." Meoni later explained that he didn't like the word "because, in his opinion, it excludes religious institutions that meet in temples or mosques." As his intention was simply to get the one word replaced, Meoni was surprised when his complaint brought even farther-reaching consequences.